In this tutorial, I’ll show you how to use scrap packing paper to produce this charming Christmas tree garland inspired by paper dolls but styled after classic gingerbread men. This project takes only a few minutes and uses materials you can probably find for free! This gingerbread man pattern is actually my own design, sketched and brought to life as a custom copper cookie cutter when I was making clay Christmas ornaments a few years ago. I needed a unique gingerbread man that was thicker in some spots and more slender in others, to stand up to my construction and firing process with clay. When I started this project I knew the same shape that made my clay gingerbread men tough enough to be handled before firing would work perfectly to make strong and unique gingerbread man paper Christmas garland. Pre-Step 1: wad the paper all up. Yes. Wad it all up. this process starts by making crinklyness a uniform texture, so gather your family and crunch, wad, and fold your way to paper with lots of crinkles and ridges. Cut the paper into strips as wide as your gingerbread man or woman pattern is tall (a cutting mat and a disc cutter make this extra quick) and bring back to the ironing board. The template provided provides a gingerbread man to be sized proportionally just right be be used on an average size Christmas tree. Lightly trace around the gingerbread man, being sure to line up the end of one hand parallel with the end of the strip of paper. Trace the figure’s outline, then I add a strong line at the end of the hand to indicate where my paper will crease as I begin to fold my strip of paper for paper dolls style garland. Begin folding each strip in an accordion pattern, leaving just enough space in between folds to accommodate the width of your gingerbread man pattern. Use your iron, on low setting now, to carefully press your folds. Ironing the folds creates crisper folds, and crisper folds mean more uniformity when cutting your pattern. Cut! Prep a stack of folded strips, then curl up with your mama scissors, your folded paper strips, a bag or small box to collect paper scraps, and some Netflix and start trimming away the excess paper on the outside the outline of your ginger-person you traced on the top of the stack. Be careful to not stack more paper than your scissors can cut through with control and safety. After you cut the shape into your first folded strip, unfold to reveal a chain of paper dolls in gingerbread form, perfect for traditional, rustic, or hipster style Christmas tree garland. A bit of scotch tape on the backside can join separate garlands together to form a long chain of hang-holding gingerbread boys and girls. That’s it! 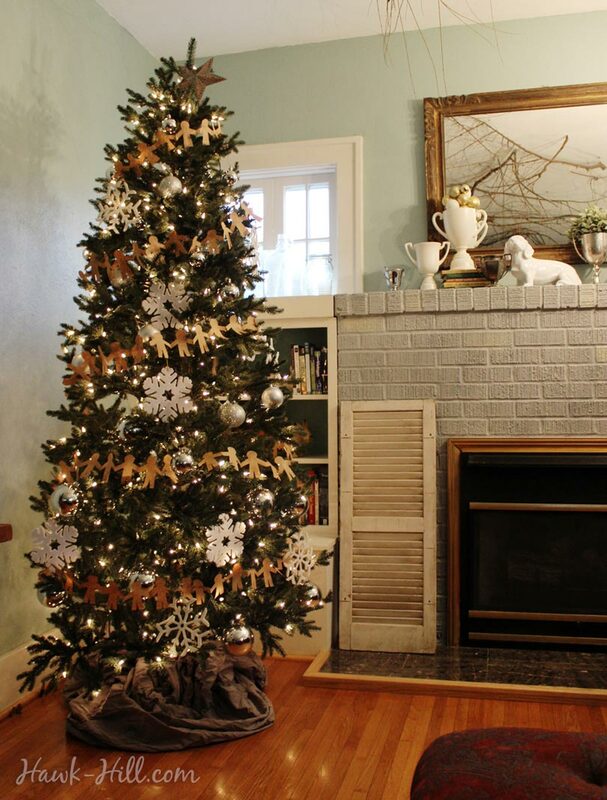 Just a few steps to enviable Christmas tree decorations that cost you nothing! This paper garland can be folded and stored in an envelope for use year after year. For repeated use, at the end of the season simply fold the paper gingerbread garland back into the according folds, pin it in place with a binder clip, and stuff into a manila envelope. For more compact storage that protects your garland from moisture or damage during storage, pop the folded garland into a FoodSaver bag and use a foodsaver to remove the air from the package and seal. This methods means your tender folded paper garland will come out good-as-new after a year of storage. The obvious answer is cost savings, but I want to point out that “handmade” Christmas decor items sold in stores, unless marked fair trade, are typically not ethically sourced. The “handmade look” is easily produced in environments where unfair wages are paid to workers in harmful working conditions in developing countries. When you hand-make your own Christmas decorations, you can create the same prized handmade look while saving money and choosing not to support companies producing home decor in unsafe working conditions. Hi, this looks great! do you have the pattern for me?